The Bombshells kicked off their bouting year yesterday with a hard battling performance in a semi-closed door game against a very strong mixed league team. Timely preparation for the first of their five Heartland Series group games, which is coming up on April 6th away to Milton Keynes. The Bombshells and MK were the two teams that sat out the first round of SE Division matches two weekends ago – a day that saw Big Bucks squeak past the Hell’s Belles, whilst Norfolk Brawds bested Bedfordshire by quite a margin – and have those four sides to face later in the year. Hi. Can you tell us a bit about the background to the creation of the Bomb S’Quad? How long have you been going? The Bomb S’Quad were formed by the three Bombshells referees Filthy Lorenzo, Electric Lee Charged and myself. We’d been training with the girls and really got the derby bug. We started talking about it in theory in April 2013. We set up a Facebook page and produced business cards to see what interest we could generate, so basically we’ve been going since then. 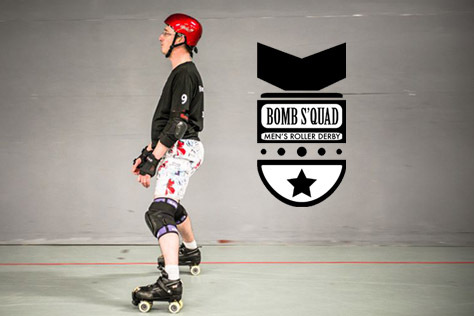 Our first official Bomb S’Quad training session was in January. How many skaters do you have at the moment? 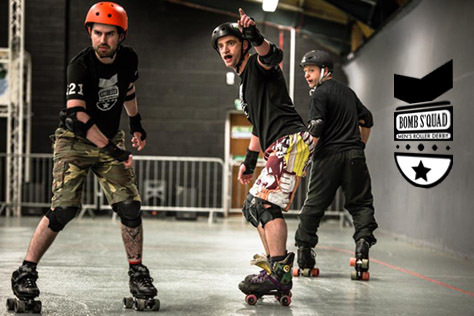 How many is the aim, and what advice do you have for anyone reading this who might want to give men’s roller derby a go? Whilst Bomb S’Quad haven’t bouted under that name yet, we know that some of you have played in mixed scrims. We also understand you’re joining forces with another team for bouting purposes. Do you have a timeline for when you hope to be publicly bouting as the Bomb S’Quad itself? Four of us took part in co-ed bout ‘The Rookie Horror Show’ (in East London) and three of us took part in a mixed men’s bout at ‘Block of Ages’ in Swindon. The experience we all gained from these was priceless. You learn what you are good at – and what you need to improve on – when you’re put in these situations. If you can work with people you don’t know, then when you come to play as your own team, a lot of your skills will be honed. We’re joining together with the Surrey Jammerwockies to take on Bristol away in April. After that we are looking to play against Portsmouth Scurvy Dogs, again in conjunction with Surrey. We don’t have an exact date when we will be bouting as purely the Bomb S’Quad. Hopefully towards the end of 2014, but if not then definitely in 2015… so watch out! You’ve had a lot of help from the Bombshells in setting up the league. Are many of them involved with Bomb S’Quad on a regular basis? The Bombshells have been amazing with helping us get up and running. We have some of the Bombshells’ directors on the Bomb S’Quad board. Their head coach Toxic Block Syndrome is also our head coach, and Bombshells trainee referee Phoenix is our bench coach. We’ve also have a lot of the girls turn up at our training to train with us and share their experience. And a massive thank you to Beast Unleashed for designing our logo, which everyone loves. With such close links between the Bomb S’Quad and Bombshells, is a combined co-ed team a possibility at some point in the future? There are no plans for it. It would be nice if in the future we could do some co-ed scrims with them, or enter the co-ed Sur5als, but as I say we’ve not discussed anything like that yet. Most men’s teams are based in big cities. Is it difficult attracting skaters to a merby side in a smaller town? Are there other leagues (such as Southern Discomfort) that you are competing for players with? I think so far it has been relatively easy to find players locally. 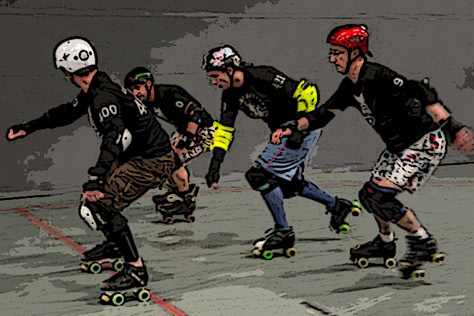 Through our links with the Bombshells, our training venue MySkateWorld, Sk8school and Facebook, it has given us a pool of experienced skaters who have decided to come along and join us. With regards to SDRD, they’re based in London and the other nearest men’s teams are Portsmouth and Surrey, which are quite far away. This gives us a huge catchment area, which includes Brighton, Eastbourne, Hastings and Worthing. In what ways does men’s roller derby differ from the women’s game? That’s quite a contentious issue and it all depends on who you talk to. I think men’s derby can appear more violent because the hits look harder, but saying that there are plenty of female skaters who hit hard. The women’s game can be more strategic and men’s more adrenaline-fuelled. What ambitions do the Bomb S’Quad have for 2014 and beyond? Our ambitions are to get bigger and better. 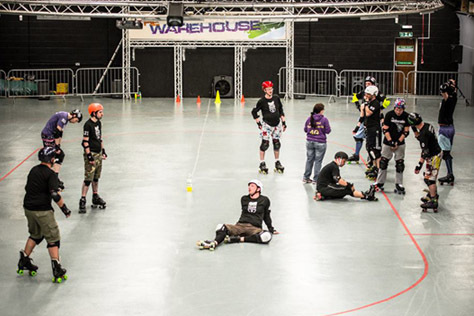 To have as many skaters as we can and to start making ourselves known in the derby world. Hopefully in the not too distant future, we could be involved in the Men’s Euros and have skaters in the England team. That’s our aim. Any particular Bomb S’Quad players we should look out for when the league starts publicly bouting? Two players to keep an eye on are Chasin’ Status and Filthy Lorenzo, who were born on skates – they seem to be an extension of their legs. Spank Me Sideways, who joined late last year, is a great skater and one to watch for the future. The rest of us aren’t too shoddy either. Finally, is there anything people out there in internet-land can do to help and/or support the Bomb S’Quad?